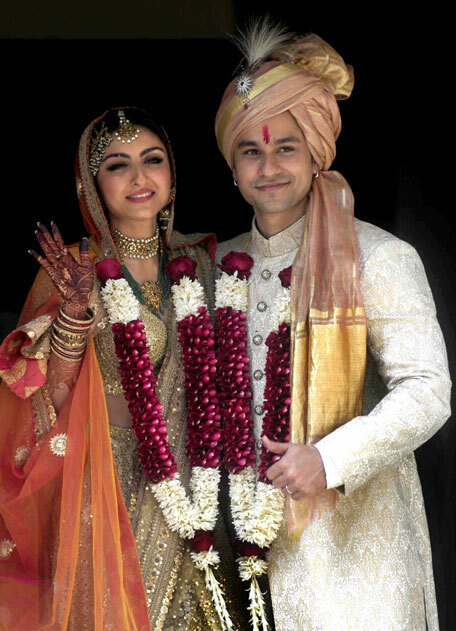 Bollywood actress Soha Ali Khan tied the knot with her long-time boyfriend Kunal Khemu at an intimate ceremony on Sunday (January 25). Here's a sneak-peak inside the wedding ceremony. The couple got married in the presence of a registrar and close family members at their Khar residence. Kunal took to microblogging website Twitter and tweeted, "A very big thank you to all of you for all the love and blessings. It's Official now !!" The wedding festivities began on January 22 with a bachelorette party by her friends - Neha Dhupia and Konkona Sen Sharma. 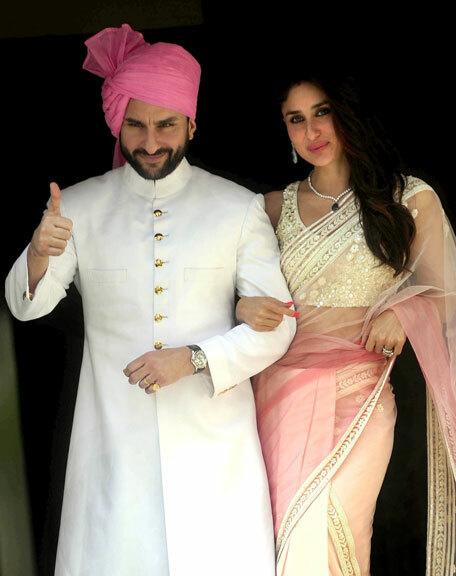 The mehendi function (pre-wedding ceremony) was hosted by brother Saif Ali Khan who pampared his little sister. 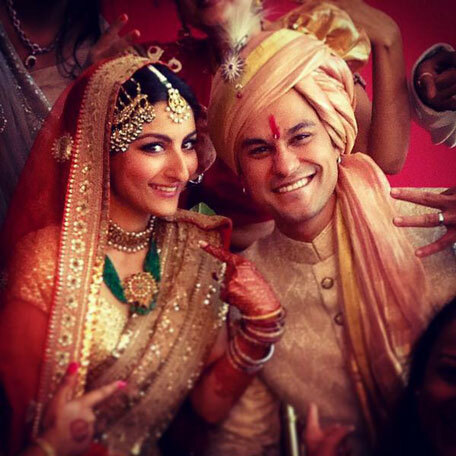 Soha and Kunal were in a live-in relationship for seven years. 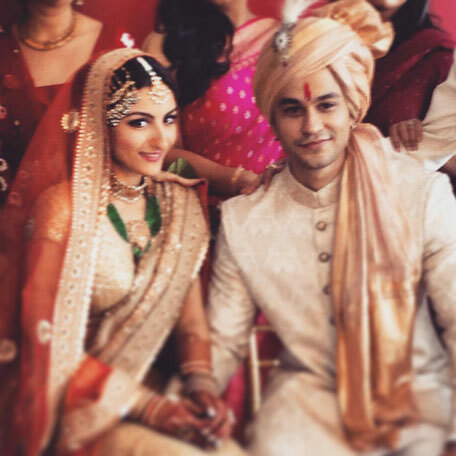 They got engaged last year, when Kunal proposed to her while holidaying in Paris. An excited Soha had then tweeted, "It gives me great happiness to share with you all that Kunal proposed to me in Paris with the most perfect ring in the world and I said ‘yes’." 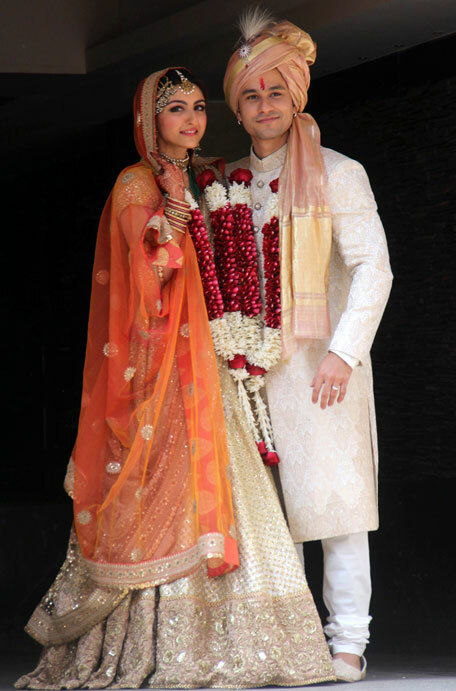 The bride was wearing a lovely cream and orange Sabyasachi lehenga. She looked a complete royal bride with heirloom jewelry to compliment the beautiful wedding dress. 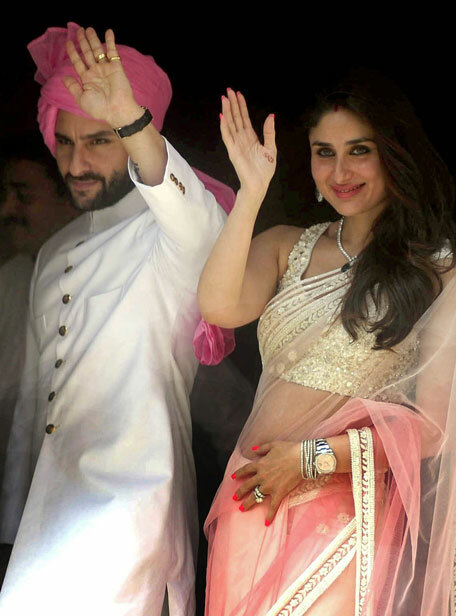 Her sister-in-law was spectacular in a pink sari by designer Manish Malhotra. 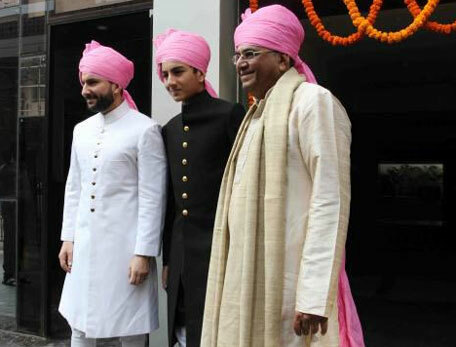 Saif was the perfect royal in a white achkan, a pink turban adding to his dapper look. Even with minimal makeup Kareena Kapoor looks absolutely stunning. 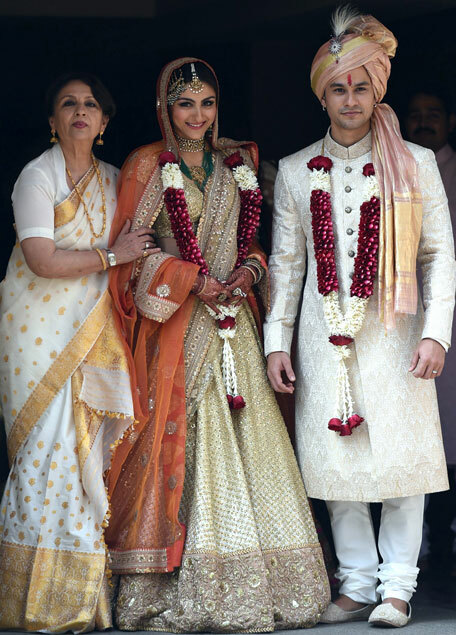 Bride's mother Sharmila Tagore looked elegant in a white and gold Assamese mekhla. While Soha's sister, jewellery designer Saba Ali Khan added colour to the festivities in embellished pink and green. 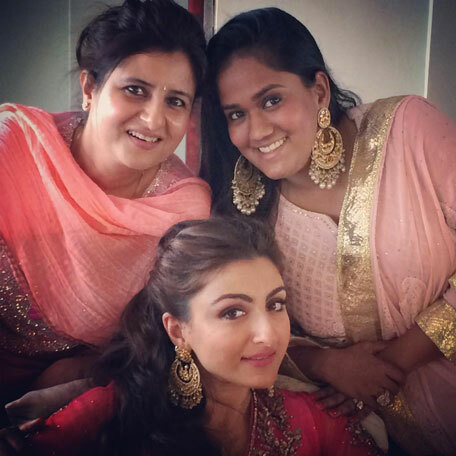 For her wedding reception, Soha Ali Khan picked a beautiful pink and gold lehenga by Sanjay Garg from his Winter Festive 2014 collection. She styled her lehenga with a matching multi strand necklace and earrings with a maang tikka finishing her look out. The 'Rang De Basanti' actress wore a pink Ritu Kumar ensemble with gota-work for her mehendi function (pre-wedding ceremony). 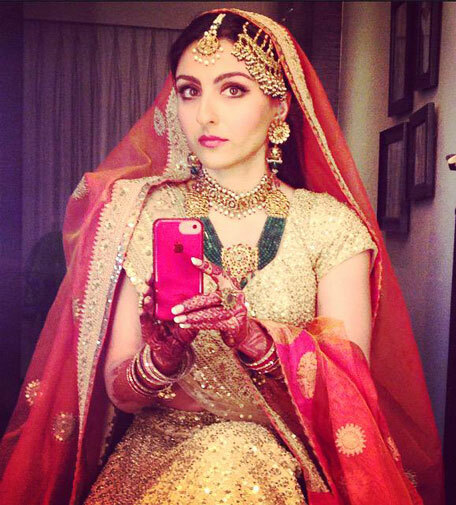 Soha chose heavy gold jhumkis (earrings) to match her bright outfit. Details about Soha's mehendi ensemble were made shared in a statement from designer Ritu Kumar which read, "The ensemble consists of three pieces and is worn one over the other. The inner peshwaz is made of a soft cotton worked with a pastel palette of the lehriya pattern done in a Rajasthan inspired theme with deep borders embellished with chutki gota. An over kurti in pink chanderi yoked with the same gota work will be worn over the peshwaz. A similar jaipuri lehran odhni completes the ensemble, perfect for a day time mehndi."